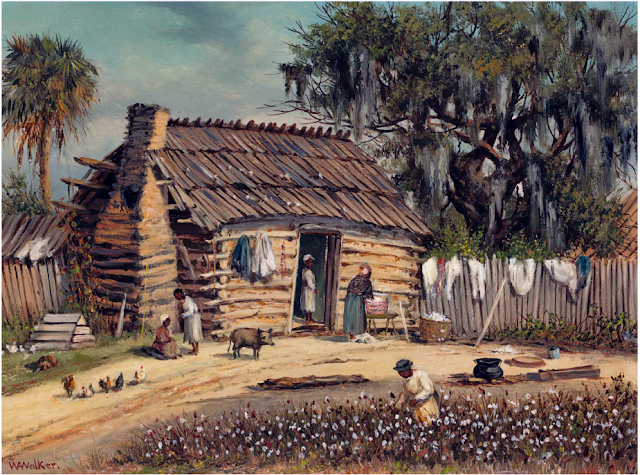 “Log and Clay Cabin with Moss-Covered Oak Tree and Palmetto,” 1878, oil on board by American painter William Aiken Walker (1838-1921). Image courtesy of Christie’s NY. Readers and students today know Kate Chopin’s writings mostly through the novel The Awakening and a number of ahead-of-their-time short stories (such as “Désirée’s Baby,” “A Respectable Woman,” and “The Storm”), but in her own day she was celebrated for her tales of local color, particularly those set in northern Louisiana. Although she was born and raised in St. Louis, two noteworthy French American connections prepared Chopin for writing stories about the people of Louisiana. Her mother was a member of an aristocratic but impoverished Creole family that had been in America for several generations, and Kate grew up speaking and writing French. Kate’s husband, Oscar Chopin, was also a French Creole, hailing from Natchitoches Parish in northwest Louisiana. The couple met at a social gathering in St. Louis and in 1870, after a honeymoon in Europe, they moved to New Orleans. When Oscar’s cotton business failed nine years later, the Chopins relocated to his family estate in Cloutierville, a small town on the Cane River. After Oscar died of yellow fever in 1882, Chopin found herself, a widow with six children, running the general store her husband had opened and struggling under $12,000 in debt he had left behind. She returned to St. Louis in 1884, and the fourteen years spent in New Orleans and Cloutierville would provide her with material for the stories and sketches she included in two collections, Bayou Folk and A Night in Acadie. The origins of the French populations of Louisiana confuse many visitors to the state, and there is a profusion of books and articles explaining the different characteristics of the people, their cultures, and (unsurprisingly) the food. The term Creole originally referred to colonists who had been born to parents who immigrated directly from France; over time, as the offspring of the immigrants mixed with Spanish, African, and American Indian inhabitants, the term included, and even became synonymous with, free residents of mixed descent. The region’s other significant French population, Acadians (or, as we know them, Cajuns), were descendants of French colonists from Acadia, a territory that included the Maritime provinces of modern-day Canada. Expelled by the British during the French and Indian War, some 12,000 exiles migrated to the American colonies or returned to France, and by the late 1760s many of them ended up in the region that became Louisiana. Populated by both Creoles and Cajuns, the Louisiana tales and sketches in her widely reviewed debut story collection, Bayou Folk (1894), were greeted with accolades, but some critics took her to task for her more daring and suggestive experiments with realism. Sales were modest; a first printing of 1,250 copies eventually sold out and a small second printing was ordered. In all, she earned about $36 in royalties—less than she usually made selling a single story to a national magazine. When she proposed a second collection, her editor at Houghton Mifflin, Horace E. Scudder, declined but encouraged her to consider writing “a downright novel.” (He seemed unaware, or had perhaps forgotten, that Chopin’s first book was the 1890 novel At Fault, which was published at her own expense but which nevertheless received significant local—and some national—review attention.) Chopin took his invitation seriously; the novel she would begin writing would turn out to be The Awakening. Chopin eventually found a Chicago publisher willing to take her second story collection. Although only a few of the stories in A Night in Acadie are actually about Acadians (Cajuns), they are all set in Louisiana—mostly near her former home in the Cane River region, which was (and is) renowned for its Creole traditions. The book closes with a “Ozème’s Holiday,” a comic tale about a plantation worker who goes on a vacation each year but, this time, he is sidetracked by a visit to a former slave who grows cotton on a small farm. Note: A fainéant is an idler (from the French for "does nothing”). Ozème often wondered why there was not a special dispensation of providence to do away with the necessity for work. . . . If you don't see the full selection below, click here (PDF) or click here (Google Docs) to read it—free!